A shooting at Marjory Stoneman Douglas High School in Florida on Wednesday left 17 people dead and over a dozen more injured. There have been 18 gun-related incidents at schools in 2018 alone. 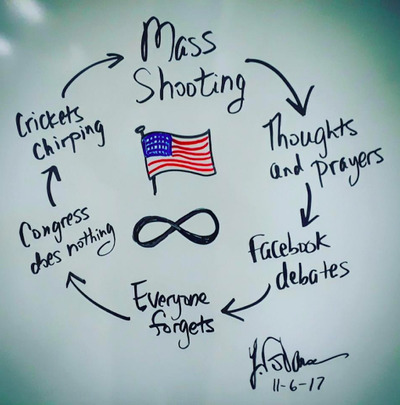 A flow chart that’s going viral on Facebook, Instagram, and Twitter captures the feeling that many people quickly forget about a shooting once it’s over, and nothing changes. Wednesday’s mass shooting in Florida shocked and horrified people across America. But many have pointed out a depressing reality – shootings are quickly forgotten until the next one occurs. A hand-written flow chart shared by the left-leaning political page Resonant Muse perfectly captures this emotion. The Facebook post calls for Congress to regulate guns more strictly, sparking a debate. It echoes the emotion of the Boston Globe’s recent front page, which reported on the next mass shooting before it happened to make a statement.